“I thought that beauty alone would satisfy. But the soul is gone. I can’t bear those empty, staring eyes.” Generally acknowledged as the first zombie film, White Zombie features a memorable performance from Bela Lugosi as “Murder Legendre,” an evil voodoo master who controls a small crew of zombies. Wealthy plantation owner “Charles Beaumont” (Robert Frazer) lures engaged couple “Madeleine” (Madge Bellamy) and “Neil” (John Harron) to Haiti by convincing them to get married on his estate. However, it turns out Beaumont is actually obsessed with the beautiful Madeleine and in order to have her all to himself he enlists the aid of Legendre to turn her into the white zombie of the title. Legendre has other, even more sinister plans for Madeleine. 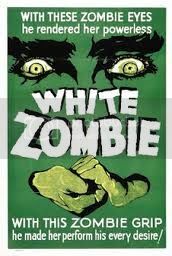 A nice low-budget, atmospheric horror flick directed by Victor Halperin, White Zombie features some eerie cinematography, mildly disturbing zombies and a thrilling finale in a creepy castle high above a cliff. The film was shot in just 11 days, clocks in with a running time of 69 minutes and opened to negative reviews. Believe it or not, Lugosi only received a salary of $800. A less successful sequel, Revolt of the Zombies, was released in 1936. Useless Trivia: In 1985, Rob Zombie named his first heavy metal band White Zombie after this movie.